Some of you probably know that I acquired a gen dial from brane and I've been getting some sage advice from theREALgoat as well. 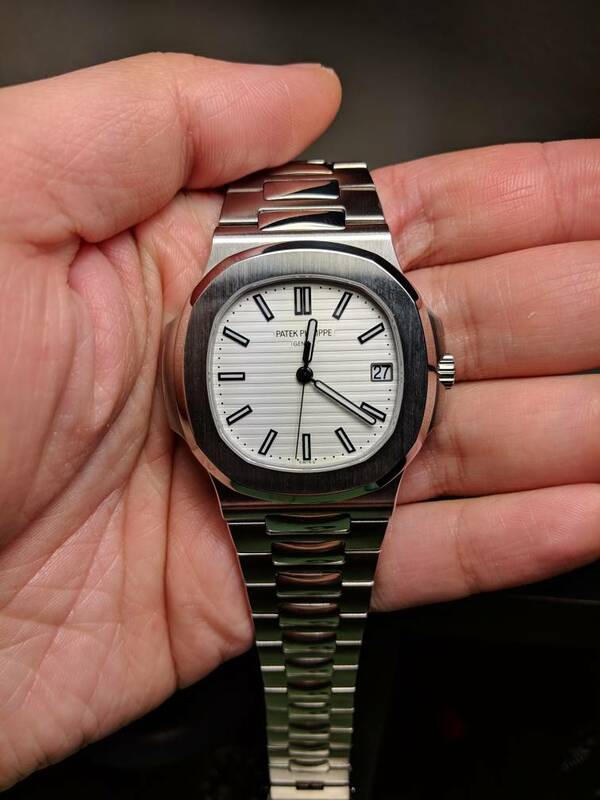 So yeah, I had the fortune of getting a gen white Nautilus dial, and I decided it would be fun to chronicle the process of getting this to a final state. However, due to CNY and unavailability/impatience, I am going to use the PF hands as the lume matches pretty closely. I can change the hands out later relatively easy after CNY. My TD has confirmed he can get me the JJF hands. Work is going to be done by yodog because he's the bomb. I asked him to put the DWO as close to the dial as possible, and he does a good job of centering the dates. I've also asked him to take pics during the process so we can all learn from his wisdom. These pics are comparing the lume color to PF. Sorry for the crappy lighting, I took them last night with my iphone before packaging them. Last edited by majwilliams0308; 24-01-19, 19:47. Where and how much did you pay for the dial if you can tell? In all seriousness I'm looking forward to this being assembled! Keep us updated on the process. Did they fix the lume colour on the new version? Are the markers applied on the dial gen? Damn so you were the lucky son of a gun who picked that up. Please let me know first if you ever decide to let go of it! yodog is also helping me with a franken. His work is nothing but top notch. Yep. The hands were relumed by yodog as well. I have already ordered the JJF hands too so it will be nice to see how it all compares. majwilliams0308 so what did you do with dial feet. Removed completely or re attached?